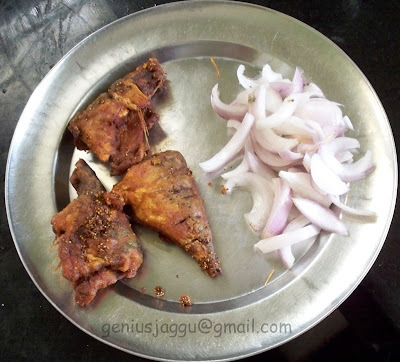 here is jaggu's Grannys Bangda fish fry...here everything is to taste and no quantitative scale needed..
First when buying Bangda fish from fisherwo-man,haggle with her/him,till s/he gives u some extra bangdas for same amount.if s/he doesnt relent, then consider walking off slowly move towards other seller...s/he will call u with voice louder than Disco music..finally when transaction is done...tell her/him that s/he will have good business today..sport a smiling face while paying...then run as fast u can...else u have to sleep on empty stomach. Cut and clean the fish(bangda)..Remove and discard the fish head(some people keep as it is,we dont use them unless our head is missing),make a small opening at the stomach of bangda,clean the insides and wash and pat thoroughly. Make 4 to 5 deep cuts on both the sides,keep aside. Mix Chilli powder,little dissolved hing and salt for smooth paste...taste the paste..it shud be xtra salty spicy..bcoz we are using fish..and fish is normally bland in taste..
roll the marinated fish in rice powder coating all sides..deep-fry the marinated fish just before serving...fry till crisp and reddish brown in color. serve with lemon and Onion and Rice and sambar...Bon appetite! !